How do I know when boiled peanuts are done? How do I know when they are done? Time, texture, taste? Comments for How do I know when boiled peanuts are done? They are done when they reach the texture, and taste that you like. If you don't know what you like, then you'll have to figure that out by eating different boiled peanuts. It's a fun, educational experience. Boil for texture, soak for flavor saturation. 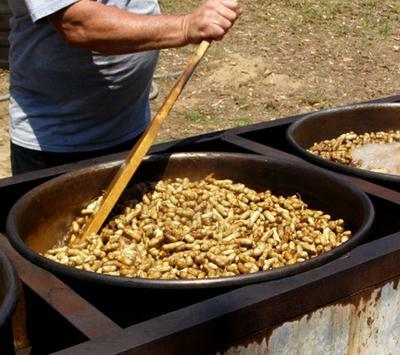 Recall the properties of boiled peanuts that you have eaten and liked. If you've never eaten boiled peanuts you should try different cooking times and methods, then decide what you like. I'm always experimenting with ingredients and methods to explore the possibilities. The raw peanuts that you boil will vary in size, taste, moisture content, and texture. Keep this in mind when boiling new bags of raw peanuts. Consider the first batches as learning to get the most out of those particular peanuts. Once you find a recipe that you like, you can repeat that with the rest of the lot. Texture comes first when boiling peanuts. Observe the changes in texture as they boil. Eat a raw peanut, and focus on the crunch and texture. Notice how the peanut feels between your teeth and in your mouth as you chew. Also, notice the raw taste. Doneness level 0 is a raw peanut. Level 10 is a peanut cooked to mush. Sample peanuts as they boil, and note the texture changes over time. You must taste several peanuts each time, because they cook at different rates. Peanuts that have fallen out of their shells cook the quickest. Peanuts with a break or split in their shell cook faster than whole peanuts in fully sealed shells. Taste them early, taste them often. Split a peanut shell and notice how easily the peanut comes out of the shell. A raw peanut drops right out of the shell. As it softens through levels 1 and 2, it is still very firm, and can easily be removed from the shell without damage. It is softening a bit, but still is hard, crunchy, and chalky in texture. It will not dent when squeezed between fingers. Through levels 3 and 4, the peanut is slightly softening, but still is very firm. The chalky quality is diminishing, and there is still a crunch to the bite. It still comes out of the shell easily, but is becoming a tighter fit due to hydration. The taste of the peanuts becomes less raw, less green. Doneness levels 5 and 6 are al dente. The raw taste is gone, the peanuts are still very firm, but not chalky. Peanuts can be pulled out of the shell whole, but no longer drop out easily. The peanuts can be squeezed between the fingers, but split rather than mash. Doneness levels 7 and 8 are softening further, but still have some snap to the bite. They press easier between fingers, splitting, but not mashing flat. They become harder to remove from the shell, and some may split. At level 9 the peanuts have become much softer, but are not yet mush. They flatten with finger or firm tongue pressure. They no longer snap when you bite them. Many split when trying to remove them from the shell. At level 10 the peanuts have become like mashed potatoes. They must be scraped out of the shell because they smash to paste under light pressure. They are over done. I prefer my boiled peanuts cooked within levels 6 to 8. As the boiled peanuts approach the texture you like, pay more attention to the wetness inside the shell, and the flavor infused from the water. Peanuts cannot absorb the salty flavor from the water until they hydrate, and then soften from boiling. Even after the peanuts soften they will initially be rather dry inside the shell. Soaking the peanuts in the cooling brine helps the water penetrate the shell, and saturate the peanuts with salty flavor. I repeat cycles of simmering and soaking to finalize the texture, wetness, and flavor of the boiled peanuts. Sometimes I refrigerate the boiled peanuts in the brine overnight to make them as wet and flavorful as possible. They can be reheated in the same brine, or eaten cold. The same boiled peanuts will feel firmer when cold than when they are hot. Drain the liquid after they reach the taste and wetness that you like.